Rega has long been the doyen of British budget hi-fi. From the early 1970s, as maker of the superb-sounding Planar series turntables, to subsequent forays into tonearms, cartridges, loudspeakers, CD players and amplifiers, its products have always been British-made, competitively priced and clearly fine 'sonic' value for money. Rega has long been hostile towards any form of hi-fi shenanigans and is proud of the fact that it has never taken any advertising in the hi-fi press. This probably explains why it has tended to operate a little outside the industry mainstream, rather keeping itself to itself while pressing on regardless and following an agenda that's often at variance with the industry as a whole. There are those who would sympathise with Rega's view of the hi-fi world, but whatever one's personal opinions, there's no denying that Rega has shown impressive engineering innovation over many years and across a number of different product categories. Hitherto, the company has always held the 'high end' in scant regard, believing very much in the law of diminishing returns and pursuing policies which place value for money high up the agenda. Even where a specific product did break through the £1,000 barrier, it would tend to offer performance comparable with competitors at more than twice the price. The news that Rega was introducing two new products, each with pricetags close to £6,000, therefore came as quite a surprise. But it's presumably a reflection of the way the market has been evolving: the traditionally youth-fuelled budget end being iPods and PCs and the mid-market shared with AV and costly flatscreen TVs. Good news then, that the more enthusiast-oriented upmarket sector is the healthiest right now. Certainly the findings seem to fit in with current market feedback. As their names suggest, Isis and Osiris are twin components: a CD player and an integrated amplifier respectively.Although each carries a £5,998 pricetag, a healthy £998 discount is available to anyone buying the pair together. Although that's undoubtedly very expensive by historic Rega standards, it's by no means unduly so across the world of high-end audio. 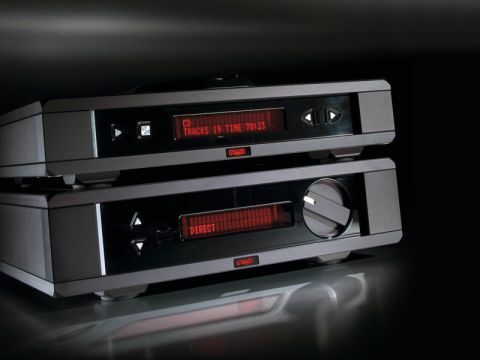 The question must be whether Rega actually knows how to make a high-end component. The units themselves definitely have the look and feel of good-quality, high-end units. The build is appropriately massive – 19 kilograms for the Isis CD player, 25.6 kilograms for the Osiris amplifier and significantly more than that when packed in their wooden shipping crates. Presentation is not only very substantial, it's also tasteful and interesting, yet discreet. The casework is constructed from machined alloy sections, with different textures and mostly gunmetal grey, while care has been taken to smooth over any unwelcome sharp edges and corners. Gloss-black sections inset into the front panels accommodate minimal controls and simple, but usefully informative, red LED displays. Both have neatly disguised on/off bars; Isis has 'play' 'stop' and 'skip'; Osiris has volume and up/down input selection. In practice, of course, the real controlling will be carried out on and by the remote handsets. In complete contrast to the units themselves, these are rather overburdened with buttons (and small difficult-to-read legends). Based on Rega's normal plastic handsets, they're nice and slim for easy one-hand operation, but cast alloy casework makes them rather thick and heavy. Paradoxically, whereas the Osiris handset will also control basic Isis functions, the reverse isn't the case, which is a mite confusing. Frankly a smaller, simpler, lighter handset able to perform just the basic functions of both would have been welcome. The top-loading Isis' prime function is simply to play CDs. It does have balanced XLR, as well as single-ended phono stereo audio outputs. And several digital signal options are available: a USB input switches the DACs to decode computer audio, while S/PDIF (electrical) and ToSlink (optical) outputs are also provided. Osiris is simple too, even to the point of omitting potentially useful functions like channel balance and mono mode. One balanced XLR input pair is intended for Isis connection, while seven single-ended pairs provide four regular inputs, tape in/out and a 'direct' input that feeds the power amp section directly (for use with a multichannel AV processor). Stereo speakers are fed from two pairs of socket/binder terminals. The Isis is essentially a 'no cost spared' development of Rega's justly popular Apollo and Saturn players. It features numerous refinements, with all three models extracting the disc data via a relatively, recently developed chip set with much greater memory than its predecessors and to which Rega now has exclusive access. Osiris also follows established Rega practice in combining a high-gain power amp with a passive preamp section, here using an Alps Blue Velvet motorised potentiometer. The power section is strictly twin-mono, even down to using two separate 400VA toroidal transformers and is strictly symmetrical in layout, too. High-quality components are used at every stage and more than ample power (2x162 watts/eight ohms, 2x250 watts/four ohms) is delivered via eight Sanken output transistors. A neat touch, is that the heatsinks on both flanks are incorporated into the casework, so there are no sharp edges. After lifting the clever parallel-hinged lid, clipping a CD onto the low-inertia three-ball chuck and closing the lid, the first thing we noticed is that the Isis carried out the initialisation process much more quickly than the Saturn, so someone's clearly been busily improving the software. Irrespective of whether Osiris or Naim NAC552/NAP500 amplification was being used, the second thing that is very noticeable is just how un-CD-like Isis' music-making is. The character of CD replay has always seemed to have a degree of largely subliminal artifice, which is why many enthusiasts have retained affection and loyalty for the vinyl medium. One crucial observation is that these elements of artificiality seem somehow to have been suppressed in the Isis and the result is unusually natural and somewhat sweeter than usual. Previously obscure and barely audible musical details become clear and make sense, in a way that hasn't been previously noticeable with other costly CD players, including the Naim CDS3/555PS, which was also on hand as a reference point. There are a number of current contenders for the high end CD player crown, most of which haven't been tried out here and all of which cost more than the Isis – some a great deal more. The Meridian 808.2 Reference was one notable example that set an enviable standard, but that was eighteen months ago, so it's impossible to make a meaningful comparison after such a long interval. Certainly the Isis must be amongst the very best and that surely helps justify its substantial pricetag. It wasn't possible to do much listening via the USB input, as the Isis simply refused to recognise our MacBook Pro (which normally operates happily enough into a firestone Audio USB DAC). Leicester dealer Cymbiosis had no such problem with its Isis/Mac interface and our Isis happily recognised and locked onto the lap-top that Rega's Paul Darwin brought along to try when he was collecting the units, so the problem remains entirely mysterious. The Osiris is rather harder to evaluate, simply because comparably priced kit doesn't crop up for review everyday of the week. So, in this case, our reference point is a far more elaborate four-box Naim NAC552/NAP500 pre/power combination, which was certainly superior to the Osiris – but then so it should be at five times the price! Osiris is certainly a lovely unit to use and like the Isis, it always sounds notably unflustered and easy on the ears, erring a little on the polite and well-mannered side for some tastes. Transient dynamics might, perhaps, be a bit more obvious and assertive, but it has marvellously tight and precise image focus, giving pin-sharp central images, yet also resolving stereo depth very well. This amplifier clearly has massive power reserves, even into quite difficult loads and never seems to get more than faintly warm to the touch. for the most part, operation is very straightforward, though the remote volume only has a single rotational speed, which makes fine adjustment for late-night listening tricky. Push the 'direct' button on the handset and you access the power amp's direct input, but the only way to get back to the regular preamp inputs is by pressing the 'direct' button again – hardly intuitive and not explained in an otherwise fully comprehensive manual. Attempts to drive the Osiris' high-gain power amp section from a regular separate (active) pre-amplifier were frustrated, as the combination had far too much gain. A similar problem might arise if the Osiris is integrated within an AV system, so anyone planning to do this should first check its compatibility with the AV processor. The suspicion that the Osiris' ultimate sound quality might be mildly limited by its passive preamp arrangement is a niggle. But, what we actually have here is an impressive double-act from Rega; an outstanding CD player – featuring a very useful USB input – and a partnering amplifier, which is a suitably capable performer.